Young's pub in Wimbledon Village. It bills itself as a hotel too, with 13 rooms available for guests. The interior is divided into a number of sections. The front part is rather nice; traditional without being fussy. It has a number of windowseats as well as freestanding tables and chairs, and the floor is exposed floorboards on one side of the horseshoe-shaped island bar, and flagstones on the other. There's another seating area further in, and a beer garden out the back. Kake visited on a Monday early evening in July 2009. Beers available were Young's Special and Ordinary, plus Bombardier. I had a pint of lime and soda at the amazingly-low price of 50p. Service was friendly. There were a fair few people in, but there were still some seats available. They were obviously expecting lots of people later, after the tennis, since all the tables at the front bore notices warning that they'd be removed "after the Murray match" and plastic glasses were stacked high above the bar. According to the Rose and Crown website as of July 2009, food is served 7am-9:30am and noon-10pm Mon-Fri; 8am-10am and noon-10pm Sat; and 8am-10am and noon-9:30pm Sun. Photo of the menu as of July 2009. 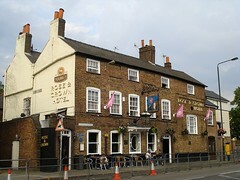 Also according to the Rose and Crown website as of July 2009, there's a pub quiz every Tuesday night. Accessibility: Step-free to get in, but the toilets are down a step. Last visited by Kake, 1 July 2009. Last edited 2013-05-10 07:57:03 (version 3; diff). List all versions. Page last edited 2013-05-10 07:57:03 (version 3).